← Inbjudan till vår första event! – Invitation to our first event! 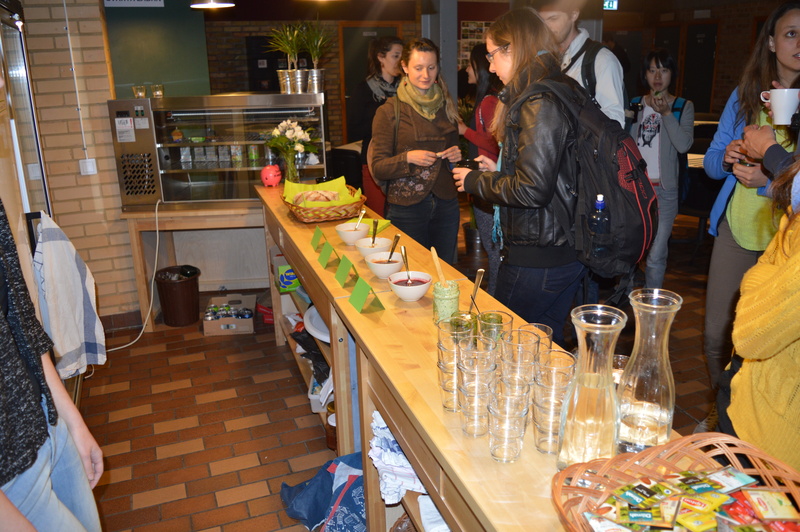 On the 5th of May we had our first event on foraging for public fruits this harvest season at the public venue Stenkrossen. The event started with tasting different sorts of jam made only with fruits and berries harvested from public places as well as recipes with wild garlic, an experience that some had for their first time, and they liked it! 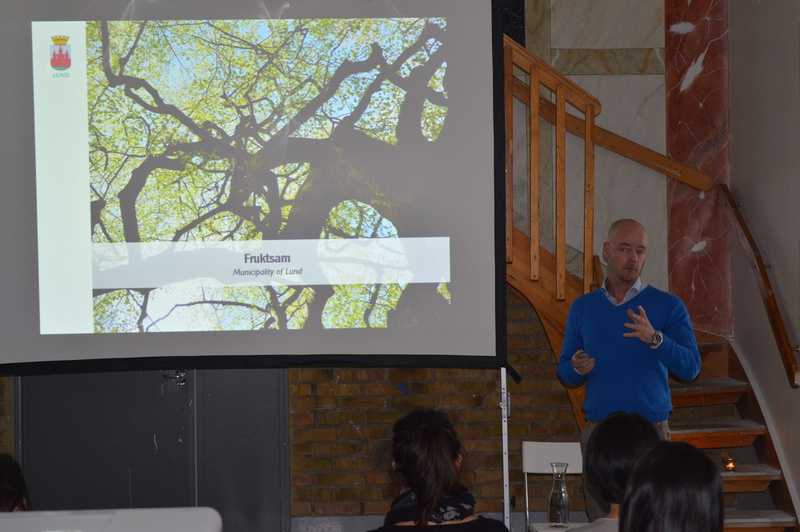 We continued with introducing the audience to our urban fruit picking initative Fruktsam. 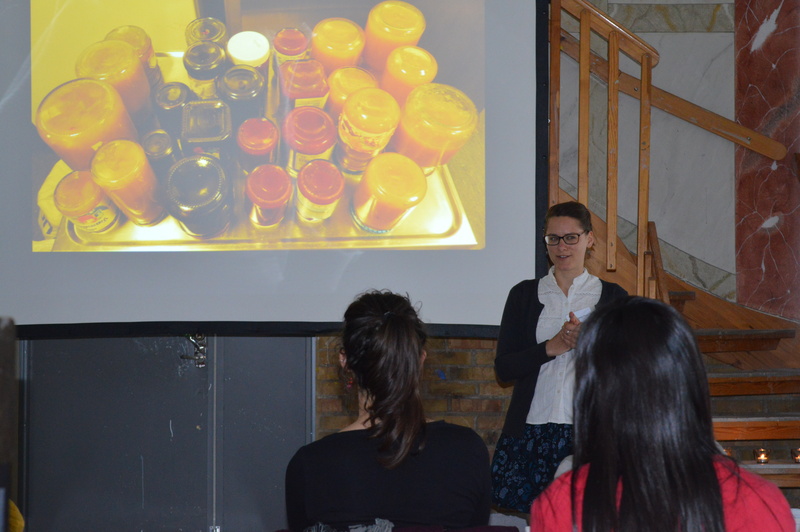 We explained how we started off: two study colleagues who wanted less fruit to go to waste and that people pick locally, seasonally and for free. We pointed out what the projects’ main aims are: increasing the amount of public fruits being picked, facilitating the access to fruits, as well as sharing and exchanging knowledge about foraging for edibles. And we shared what the project’s core activities are today: organising seminars and fruit picking events, hosting a study circle to learn about edibles, maintaining a participatory harvest map and sharing other insights all around foraging. We then happily welcomed Karl-Oscar Seth, head of Lund municipality’s nature and park department which is responsible for the public fruit trees. He spoke about the municipality’s positive attitude towards picking public fruit. It means less rotten fruit on the ground which of course means less maintenance work for them. Every year people complain about fruits falling on their cars or wasps around the fallen fruit. Picking fruits also means that citizens make use of the public parks and create knowledge and awareness of nature in the city. Even though people complain about fallen fruit, they also express appreciation for the cherry blossoms and apple blossoms in the spring. The main concern for the municipality, when it comes to picking fruits in public spaces, is safety. It is important to be careful to not break branches in the trees but most of all it is important that people do not injure themselves. So climbing is not recommended. In general, all kinds of public fruit can be picked. If in doubt, Karl-Oscar recommends to contact the municipality. Interestingly, city planners have a tendency to plant fruit trees based on their aesthetic value, especially cherry trees are favoured by landscape architects due to their beautiful flowers in the spring. However, more knowledge on what type fruits trees could be planted in cities would be needed. For that purpose, Karl-Oscar is happy to cooperate more with Fruktsam. 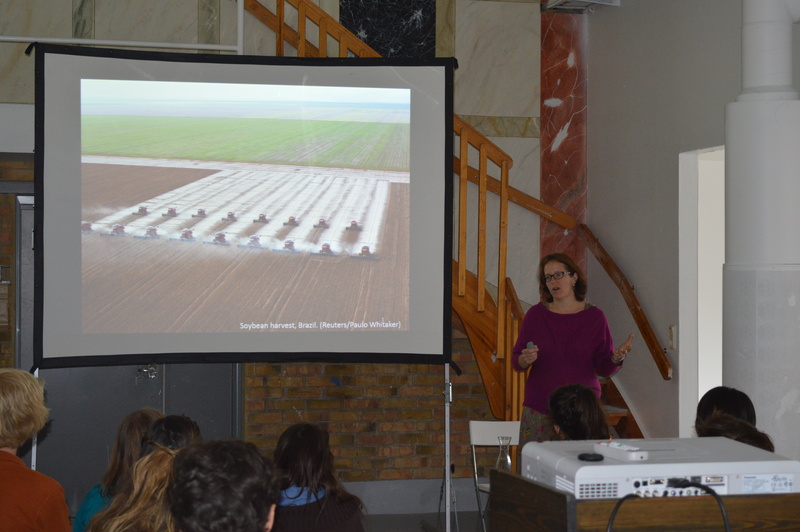 Assistant professor of Sustainability Science, Kim Nicholas, shared her valuable research on urban food forestry. According to Kim, the traditional separation of natural ecosystem and unsustainable farming has to be bridged to even out the one-sided intensive farming but still produce food for people. Also, where people live and where fruits trees are growing have to be connected to improve resilience, improve food security as well as increase ecosystem services in the cities. Kyle and Kim have also recommended fruit species that are the most suitable for cities, an overview can be found on Kyle’s webpage. Most municipalities in the US are well aware of the habitat and food benefits of trees to wildlife but not of the potential for trees to provide food for people. Seems like Lund is heading in the right direction! The research that Kim and Kyle Clark have done, showed that most similar initiatives to Fruktsam around the world are engaged in either planting, mapping or harvesting fruit trees. According to Kim, the ideal would be to be actively overlapping all three of them. Fruktsam is on a good way: We already focus on both mapping and harvesting! Now we just need to figure out what fruits, berries and nuts we are missing and which we should get planted. 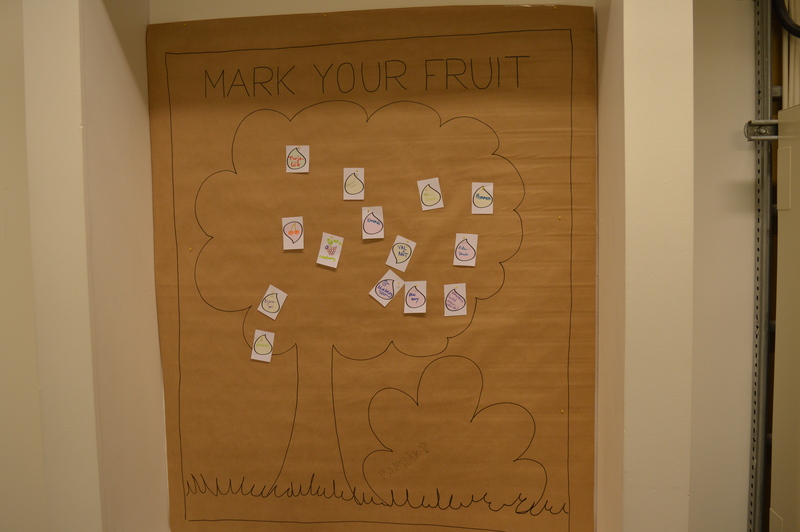 So we asked the audience to mark what kind of fruit they want to see more of in their city. We saw requests for more nuts but also more raspberries and cherries. We will continue with this throughout the year and in the end we can hopefully influence Lund’s fruit tree development together! We thank the speakers for presenting and the audience for the active participation, and hope to see you and many more at our upcoming picking events! This entry was posted in Events, Research. Bookmark the permalink.